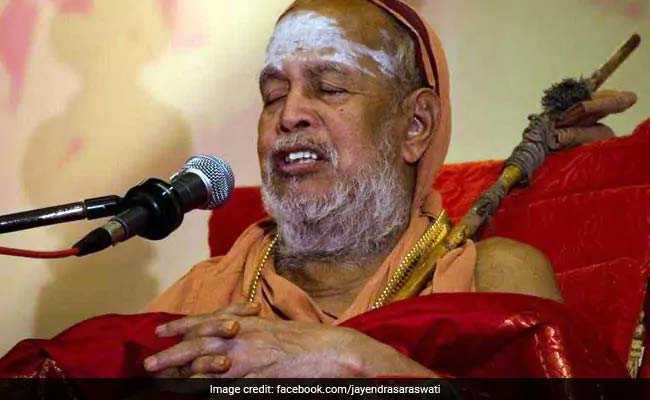 Kanchi Shankaracharya Jayendra Saraswathi, the head of the Kanchi Mutt, died on Wednesday in Tamil Nadu's Kanchipuram. He suffered a cardiac arrest. Shankaracharya Jayendra Saraswathi was the 69th pontiff of the Kanchi mutt. New Delhi: Kanchi Shankaracharya Jayendra Saraswathi, the head of the Kanchi Mutt, died on Wednesday in Tamil Nadu's Kanchipuram. He suffered from cardiac arrest. The rites of the 82-year-old guru, described as 'Brindavana Pravesha Karyakramam' in vedic parlance, will commence on March 1 from 8 am, according to the mutt. His samadhi will be placed closer to his predecessor and guide Chandrashekarendra Saraswati. The website of the organisation announced, "The 69th Acharya of Sri Kanchi Kamakoti Peetam Jagadguru Pujyashri Jayendra Saraswathi Shankaracharya Swamigal attained Siddhi at 9 am today - Shukla Trayodashi - 28 Feb 2018 at Sri Kanchi Kamakotii Peetam Sankara Matam, Kanchipuram." The acharya was not keeping well for over a month and was rushed to a Kanchipuram hospital early in the morning after he complained of breathlessness. He was unconscious when he was brought to the hospital. His vital parameters, including blood pressure and pulse, were weak. He died despite doctors' efforts to revive him. 1. Shri Kanchi Kamakoti Peetam, a matha or mutt is a prominent Hindu monastic institution in Tamil Nadu's Kanchipuram. Its head is known as "Shankaracharya". 2. The mutt was founded by Adi Shankaracharya in 482 BC and runs several schools, eye clinics and hospitals. It has a huge following in South India. 3. Born in Irulneeki, a village in Tamil Nadu's Tiruvarur district, as Sri Subramaniyam on July 18, 1935, Shankaracharya Jayendra Saraswathi was heading the Kanchi Mutt since 1954. He was its 69th pontiff. 4. The junior pontiff Vijayendra Saraswathi will succeed Jayendra Saraswathi as the 70th pontiff of the mutt, according to the mutt rules. 5. Shankaracharya Jayendra Saraswathiwas among those charged in a 2004 murder of a Kanchipuram temple employee. In 2013, he and 22 others were cleared of the charges.